The Florida Coastal Management Program (FCMP) is a network of state agencies implementing 24 statutes that protect and enhance the state’s natural, cultural and economic coastal resources. 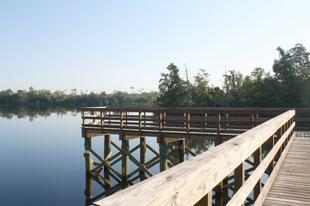 The Florida Department of Environmental Protection is responsible for directing the implementation of the program. 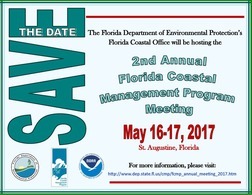 The FCMP Annual Meeting provides an opportunity to bring together various stakeholders and partners to broaden awareness of the program’s activities, expand partnerships and discuss local coastal management issues. Formed in 1998, the United States Coral Reef Task Force (USCRTF) works to lead U.S. efforts to combat the problems facing our coral reefs. 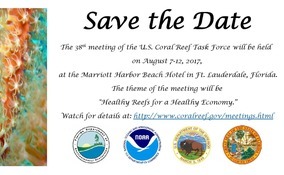 The USCRTF is comprised of representatives on many levels from regions that contain, or benefit from, coral reef habitat, including state, territorial, commonwealth and local government agencies, nongovernmental organizations, the scientific community and commercial interests. The USCRTF members meet twice a year to remain up to date with individual projects through progress reports, to propose and approve new actions and to reflect on past accomplishments to generate new objectives. Read more about this meeting, here. The Florida Coastal Management Program’s Coastal Partnership Initiative (CPI) grant opportunity promotes the protection and effective management of Florida’s coastal resources. CPI makes federal funds from the National Oceanic and Atmospheric Administration available to local governments of the 35 coastal counties and municipalities within their boundaries. CPI grants focus on four categories: Working Waterfronts, Access to Coastal Resources, Resilient Communities and Coastal Resource Stewardship. 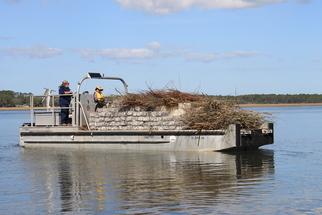 The Guana Tolomato Matanzas (GTM) Research Reserve recently began a project that will test the efficacy of a new strategy for protecting coastal habitat in high-energy environments, integrating engineering and ecological approaches by developing “gabion-breaks,” a hybrid method for building living shorelines to protect and restore coastlines. Living shorelines provide stabilization using a combination of coastal native vegetation for sediment stabilization and breakwalls constructed of oyster shells, limestone rock or other structures to the natural environment.